With Fall upon us, the time to pick Jersey peaches is quickly winding down. So last weekend, I set out to make sure I got my peach picking in before it was too late. After buying way too many peaches at the orchard, I was left with the dilemma of what on earth to do with them all before they went bad and so I quickly whipped up a peach crisp. A crisp is one of the easiest and quickest fruit desserts that can be made and is so simple that you have no excuse not to try it! 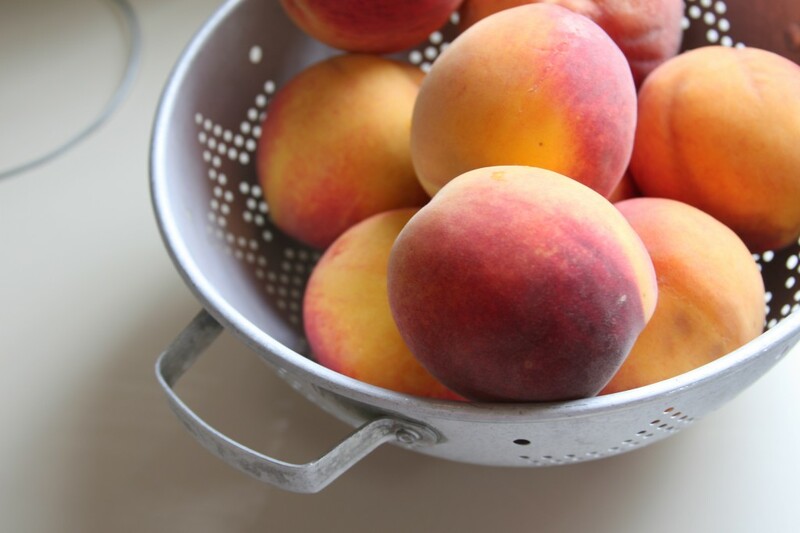 To easily peel the peaches, drop them into boiling water for about 30 seconds. Let them cool enough so you can easily touch them and peel off the skin with your hands. Then slice them and place them into your dish (I used a 9″ pie plate, but you can also use a 8″x8″ pan). Drizzle them with the almond extract. Combine the flour, oats, sugars, and spices. Cut up the butter into cubes and drop into flour mixture. With your hands, crumble the butter into the mixture until it resembles course crumbs. Sprinkle the flour mixture over the peaches and bake in an oven preheated at 375 degrees. Bake about 45 minutes or until browned and bubbly. Enjoy warm with a scoop of vanilla ice cream!